Now ... what's wrong with this idea? I still see wire nuts - and it's a field installed connector. Not so obvious is that every manufacturer (I have samples from three) has connectors that are unique to that maker. WHY are we the ones to install these white elephants? I suspect that 90% of all ballasts made are made by three companies. 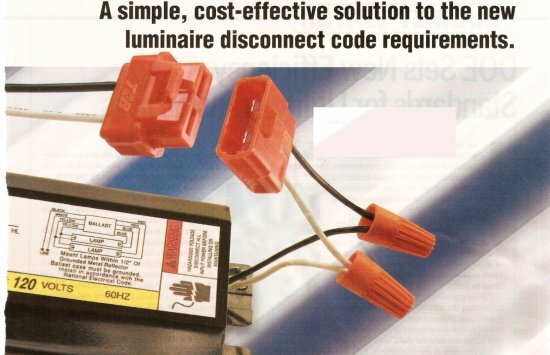 It ought to be for THEM to sell the replacement ballast with the male half of an industry standard connector; then we could get the female half at the parts house, and install it at the time of replacement. Heck, I'm pretty sure that Advance ballast has enough muscle, that whatever connector they chose would dominate the market. Ditto for new fixtures; there is no reason for them to leave the factory without these connectors already in place. I thought the idea behind the code change was to make things safer, and reduce the dangers of working 'hot.' Since these connectors are field installed, and NOT interchangeable between brands, and NOT supplied with either the fixture or the ballast .... I predict the result will be MORE injuries, rather than less - until this albatross flies away! Last edited by renosteinke; 12/16/07 02:00 PM. We install a T&B like pic above to satisfy NEC. The T&B is 'opened' to de-energize the ballast for replacement purposes; right?? The ballast hot & neut are cut/unspliced from the 'dead' end of the T&B then, right ?? THe ballast H&N are respliced or stabbed into the dead end of the T&B and the T&B is inserted into the female 'live' end, right?? So, based on the above....why would a different mfg/config enter the equation?? The switching is not required on every light and the code has not been adopted everywhere. If manufacturer "A" is paying someone to wire a switch, while manufacturer "B" is not paying some one, manfacturer B will likely sell their lights for less so who do you think is going to sell more lights? This is part of the ugly side of business. If you have been in the trade long enough you will see the qualitity in construction of fixtures and everything else come down in qualtiy. The cheaper it can be produced, the more proifitable and competitive the company is. Maybe in time, you will see it pre-wired at the factory. Another posibility is factories will need to retool and this disconnect is a interim fix. Retooling even for the smallest change is way more complicated then many realize. It seems that the additional steps required ... to undo the wire nuts, salvage the pigtailed connector half ... and reconnect are an unnecessary complication. Heck, if I'm going to play with the wire nuts, I might as well continue to do it the 'old fashioned' way. Indeed, I expect that the first thing to happen will be for these connectors to be cut off and discarded. Take the wire nuts out of the equation, and at least you have 'convenience' as a selling point. Put half the connector on the ballast .... I don't see ANY change at the fixture factory. The only obstacle is the lack of interchangeable plug patterns. If the connector makers aren't willing to work together, the ballast makers will make the decision for them. That market is so lopsided that Advance, acting alone, will decide the issue all by itself. Which, of course, brings up distribution conflicts. If the WAGO pattern is chosen, places that carry Ideal, T&B, or who knows what brand will be at a disadvantage. This is exactly the situation NEMA standards exist to prevent. You might as well have every receptacle maker use a different pattern ... and have the customer fit the plugs to their appliances. How much do those things cost per piece? It seems that they are trying to make it safer for unqualified personnel to do this type of work. I think any safety advantage of this type of disconnecting means is marginal at best, because you still must remove the bulbs and disassemble the energized fixture to get to it. I’ve seen a lot of bi-pin fluorescent fixtures with black arc burn marks just below the lamp sockets from inadvertent contact with the grounded metal housing. You can still sometimes get a good wallop from a de-energized fixture from residual capacitance stored in the defective ballast. Personally, I don’t think I want to hold one side of that little plastic piece of crap in each hand while energized when I remake the ballast connection. Especially not under any load and even more so with 277v. It's all smoke and mirrors..(bullsh*t). Who in their right mind would do it? Wich inspectors will look? Is this now going to be part of the final? Open all fixtures for inspection? We are all smart enough to hit the switch. Most accidents do happen opening and closeing the fixture as KJ stated. Nice try, but its another "feel good" item that is in print and not practiced. Leland that possilty that true but one thing i will agree with John one point with the connectors on the flourscent luminaires. what really compound it is all 3 connectors manufacters have diffrent styles. which i will personally dont like it because i have to stock each items in my truck which IMO it kinda waste my time and money to monkey each items. AFAIK there is total of 5 diffrent conferations from 3 manufacters now. and each one have it own style that really can be a sore thumb pretty fast. espcally if you have large qualinty of ballast changeover it will add up fast with the figures. Is it me, or ???? Someone is going to install the disco-conn, RIGHT? It comes in two pieces, Right? It should be installed within NEW fixtures we buy, Right? Is it that the fixture is only coming with the female half? Why would anyone have to carry/stock all the different types?? As to the reasoning for it; when adopted, it will be "Code"
MPO, they will 'mysteriously vanish' with a ballast change-out. Is there going to be a different style for each voltage? IMHO, no, as are wirenuts.